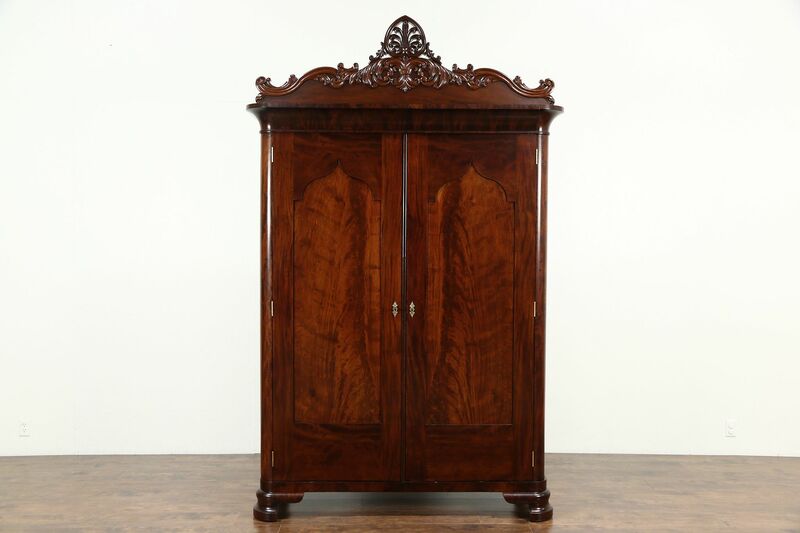 A spectacular Victorian period armoire, wardrobe or closet was hand carved of solid mahogany about 1875, and has a fitted interior with drawers and closet poles. The restored finish is in excellent condition, flattering the matched flame grain burl panels and glowing warm patina. There are tiny shrinkage separations from age as shown. American made antique furniture, masterful detailing is three dimensional. Interior drawers have hand cut dovetail joints. Doors have working locks and keys. Closet poles on the left are later and removable. Dimensions are 66" wide at the crown, 24" deep, overall height is 103 1/2," without the detachable crown, height is 86."